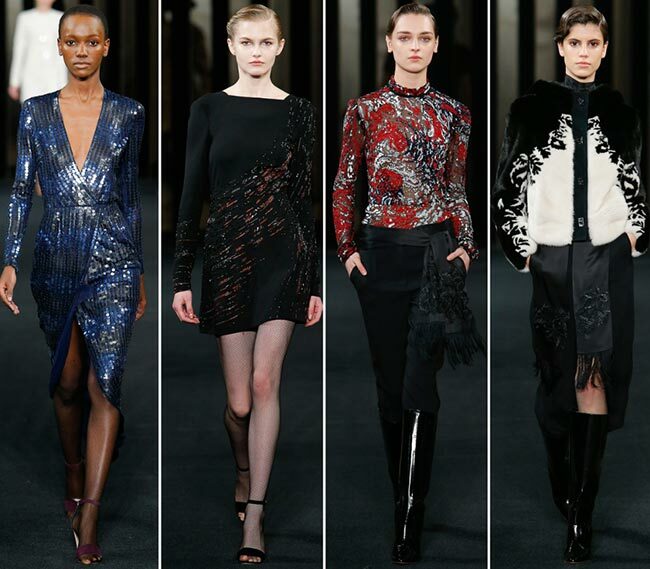 It is the eternal glamour of the New York City nightlife that seems to have inspired Giles Mendel, son of Jacques Mendel, of the eponymous J. Mendel fashion house for his J. Mendel fall/winter 2015-2016 collection. Apprenticing under such a father cannot have been easy, but Giles Mendel knew how to hold his own and brought the Paris fur salon to New York by establishing the first boutique at Elizabeth Arden’s Fifth Avenue Salon. The fur collection would gain in fame soon enough and would serve to become a favourite among the chicest that Manhattan had borne. A fifth generation company established on the premises of extraordinary luxury, J. Mendel offers exceptional quality and unparalleled style, characteristics not found on every designer in the United States of America. Giles Mendel’s expertise lies in the manipulation of luxury fabrics in unexpected ways but still keeping to a rather high level of craftsmanship that may not have been foreseen by customer and investor alike. He makes his pieces timeless, on the cutting edge of fashion and exquisite to behold. The fashion has been established well and has broadened its presence to include cities such as Berlin, Hong Kong, Kiev, Cairo, Athens and Zurich. It is a distinguished furrier that we can expect to find on an international level and one, which has done an incredible job with putting together its J. Mendel fall/winter 2015-2016 collection for the New York Fashion Week. 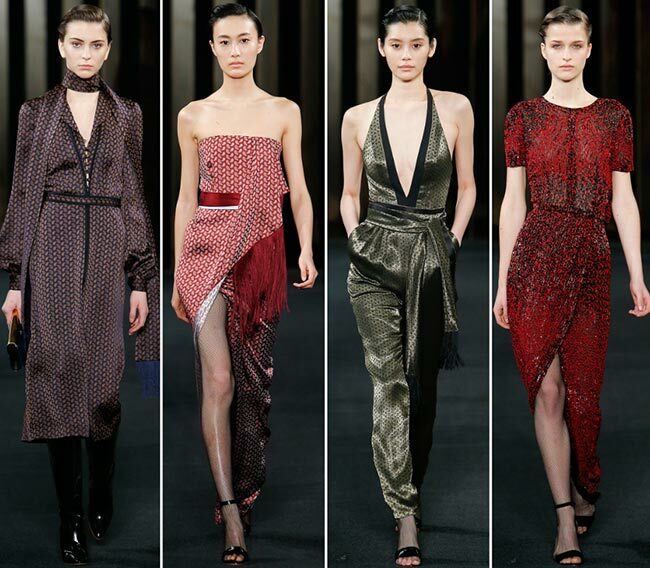 The pieces presented have been beautiful to behold and quite edgy, what with the see through mesh blouses and all. 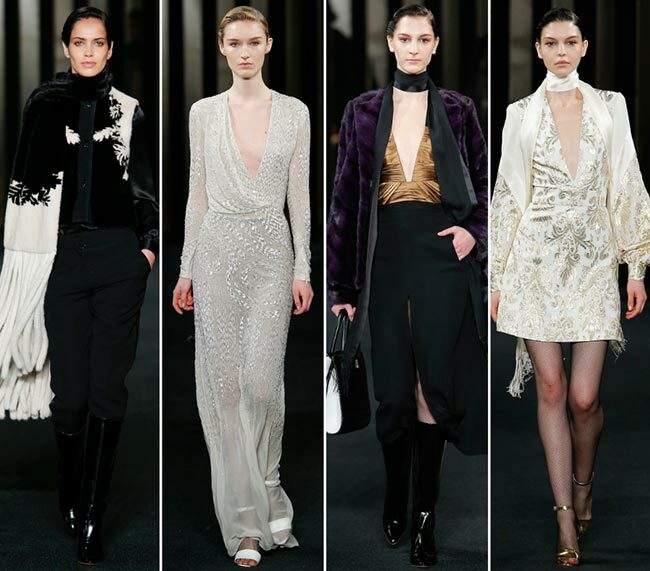 While the show began with a black and white number in velvet and fringe over a pair of trousers and knee high black leather boots, that is certainly not what it finished with. We loved how it moved into a dress wherein the sleeves left the shoulders and upper arms open, the keyhole slit on the chest giving us a sliver of skin to enjoy and the slit up the middle ensuring we saw enough thigh, considering the midi length of the piece itself and the knee high boots worn underneath. Fringed scarves seemed to find their own way to dominate the runway, worn under black and white floral patterned coats, as sashes around the waist or ties around the neck vet better effect. And then we ran into the evening gowns that seemed to look like nightgowns of the rich, with their sheer lace and the deep plunging necklines, the thin spaghetti straps and the gentle flow of the fabric over a woman’s silhouette. Perhaps the most intriguing of all was the use of sheer black mesh tops with velvet collars rucked into midi length, high waist skirts with buttons down the middle, with a fur coat thrown on top for some warmth. 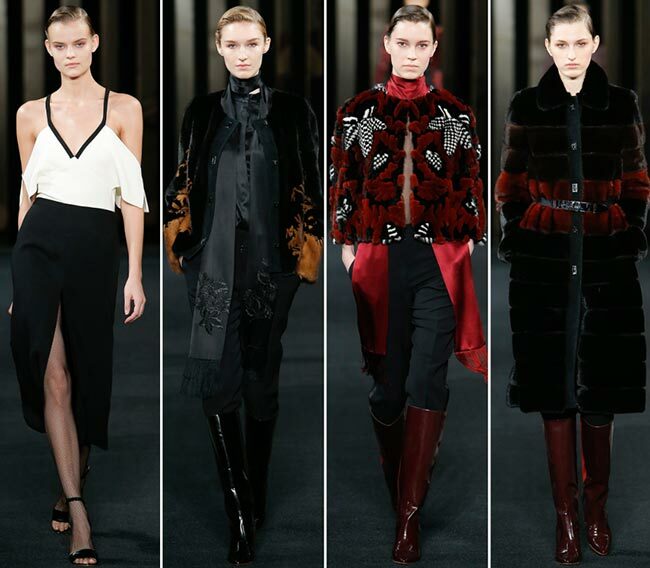 Those tops appear a few times over within the collection, though it looks especially amazing with the longer red midi skirt with the skit up the middle and the ankle length fur coat thrown on top, a red silk fringed scarf around the neck and red and black velvet handbag carried along the way. 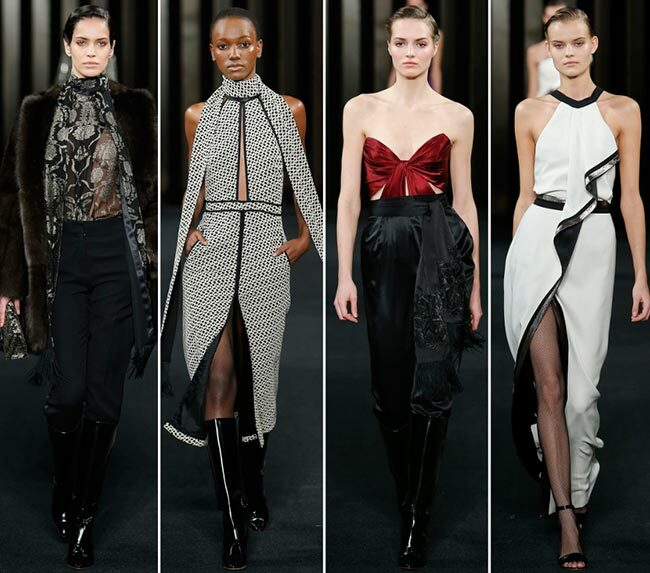 We fell in love with the J. Mendel fall/winter 2015-2016 collection from the start and will probably be reviewing these pieces time and again to try and decide on which piece is the most appealing among the 46 presented today.